Sustainable seafood that includes, Salmon, Halibut, Sea Bream, Cobia, Rainbow Trout, and Oysters are all valuable commodities threatened by harmful pathogen infestation. But they're not the only ones. Public exhibits of fish, invertebrates, mammals, reptiles, and birds-all living examples of our natural world-are also in constant danger of coming in contact with harmful pathogens. It's no secret that our world is faced with declining water purity and availability. This, combined with increased disease outbreaks, has resulted in continued pollution and the introduction of new waterborne pathogens to natural waters. There is a solution... UV Disinfection. The chart on the next page lists the most common pathogens found in Aquaculture and identifies their required Fluence (UV dose) for inactivation. Aquaculture has used UV disinfection to control harmful waterborne pathogens for many years, but few design-consultants, purchasers, and operators truly understand UV's limitations well enough to use it successfully and cost-effectively. To achieve successful UV disinfection one must apply it correctly! The first step in applying UV disinfection correctly is to familiarize yourself with the targeted pathogens. This helps to establish the application's UV disinfection requirements. Keep in mind, no two pathogens are exactly alike and all require their own specific UV-C dose. The diagram above demonstrates the complex life cycle of the warm water protozoa Cryptocaryon (marine white spot). The diagram illustrates the four life-cycle stages of this lethal protozoan. It reveals the microorganism's physical size and actual life-span based of its life-cycle stage. The free-swimming Tomite excyst or infective stage, when the microorganism is smallest (25-60 µm), is the life-cycle stage where UV Disinfection is most effective. UV doses not accompanied by a specific log value, should be considered a minimal dosage. The listed data was collected from various sources and RK2 Systems, Inc. does not accept any responsibilit y for the accuracy of this information. This information is meant to be a guideline and should be used as such. UV-C light, when used properly, is the safest and most effective solution for waterborne pathogens and nuisance waterborne green algae (pea soup green water). Using UV-C light leaves no residual chemicals in the water and is much safer to use than medications. Best of all it’s natural! Ultra Violet light is a spectrum of light just outside the range of light that is visible to the human eye. UV-C light is one of the four subgroups of Ultra Violet Light. UV-C falls in the spectral range of 250-280nm, with the peak being 264nm. This is what is called the germicidal range and is capable of altering or destroying DNA. 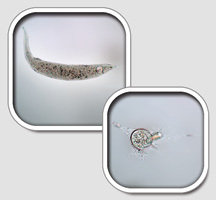 By exposing pathogens and waterborne algae to the UV-C, its DNA is either altered or destroyed and leaves the micro-organism incapable of reproducing. Your RK2 Systems, Inc. service representative will carefully guide you through the UV system sizing process. Your representative will also provide you with critical technology information while following our UV system purchasing-sizing protocol. Our 5-Step UV System sizing process addresses critical operating characteristics that ensure you will select the best SafeGUARD UV System for your application. Our clients typically know their target microorganism when inquiring about a UV system. Our UV Dose Chart includes known UV doses for some common pathogens found in aquaculture. 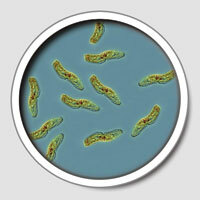 There are approximately 65,000 known protozoa and 4,500 bacteria, all of which require their own specific UV-C dose. Your RK2 Systems, Inc. representative will help you establish a target microorganism and, in turn, your required (minimum) UV Dose. The next step in sizing any UV system is to determine the required capacity based on worst-case water conditions (low %T). UV transmittance (UVT) is not turbidity! The water's clarity is not an effective indicator, because both solid and dissolved material can absorb UV light. For example: metals (iron) in water are not visible to the human eye but absorb UV light and have a negative impact on UVT. UVT is the transmission of UV light (254 nm) through water. Regarding Aquaculture applications, flow-through fish-culture systems requiring influent disinfection typically test at 90-95%T. In contrast, RAS recirculating aquaculture systems) typically test lower at 70-85%T. Application conditions vary and, therefore, must be evaluated individually. UVT must be considered when sizing any UV system. Using a meter is the only method of determining an application's true %T. It is important to mention that UVT is not linear. The UVT Chart below reveals actual fluence (UV dose) loss based on % UV transmittance (%T). 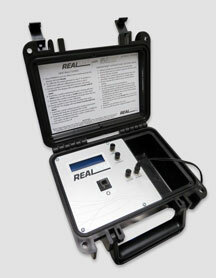 The Real UVT Field Meter manufactured by RealTech Inc. is available in both in-line and portable versions. Your RK2 Systems Representative can assist you with more information. The line-graph below illustrates how a lower %T parallels a diminished UV dose when operating our Pro-Tect UV Systems model ALH62D8 at a flow-rate of 150 GPM. Notice the distinct drop in achieved UV dose with only a slight change in %T. Your RK2 Systems, Inc. representative will provide you with UV System options. Choose between plastic or stainless steel UV vessels, as well as sophisticated or basic controls. No other UV system manufacturer offers you this degree of flexibility and cost-savings. Once all critical operating factors and system details are known (water flow, UV dose, material of construction, monitor/control options), your representative will suggest the SafeGUARD UV model that best fits your application and budget. Most UV system manufacturers are reluctant to share cost of ownership numbers for their equipment. RK2, on the other hand, are excited to share this information with clients, because we know our Pro-Tect UVs have proven to be the most reliable, operator-friendly, and cost-effective UV Systems on the market. Your RK2 Systems, Inc. representative will provide a UV System Performance Verification Certificate with the UV system price quotation. This certificate guarantees that the Pro-Tect UV System you purchase will achieve the operating performance (UV dose) we specify. UV System performance is calculated by the Bolton Photosciences UV CALC Modeling Program.